The number of ramen stalls in Singapore has grown sporadically, especially after the popularity of Ramen Keisuke Tonkotsu King. Ramen Matsuri is one of the newer stalls that I have just heard of. It is located along the restaurant stretch off Battery Road, in the store that previously housed Ramen Baikohken. My friend and I went for a dinner after work at around 7pm when we reach Ramen Matsuri. Sadly, the restaurant was almost empty. There were few customers and some were Japanese dining solitary. The store was just like a traditional simple ramen bar, although there is no bar here. The tables were limited but enough. The decos are mostly similar to what Ramen Baikohken had. We were greeted by our waiter who is a Japanese. Menu selections were pretty simply: 2 soup based to choose from (original and miso), and some various toppings. The ramen chefs are also Japanese. I ordered the Spicy Miso Tamago Ramen ($12). I like the presentation of the ramen, although the photo certainly did not do any justice. I love how the crispy nori was placed and combined within the bowl. My favorite component was of course the spinach! It was rare to have spinach in the ramen and it tasted really good. As for the soup base, I thought it was not bad neither it was so special that I would remember and crave to eat. As we finished eating more customers came in and dine. 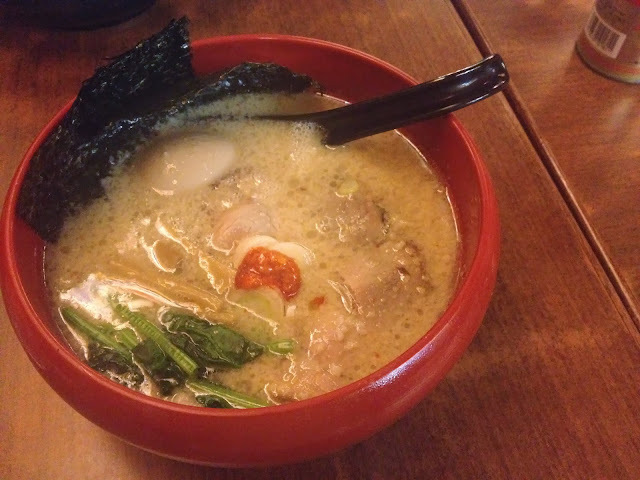 I thought our dining experience at Ramen Matsuri was not bad. This place could be a convenient place to grab dinner for those who work at the CBD.